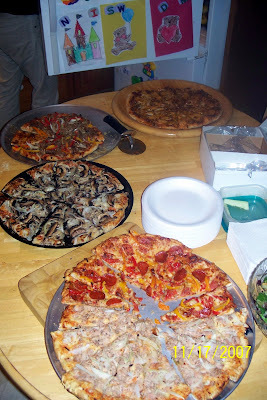 Every year around this time Uncle Gene (Nick's brother) and Aunt Andrea (sister-in-law) have a pizza party. It is mostly an event for Andrea's mom's family... but we are always included. Andrea has a very big family (like I do) and it's always nice to see everyone. Gene spends a lot of his time in the kitchen making way too many pizzas. You can't help but eat too much. 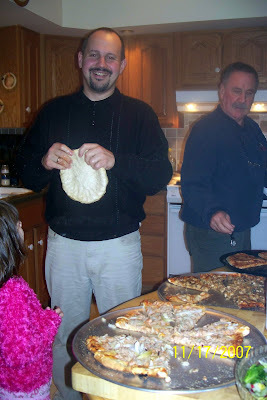 He makes more kinds of pizza than I can count. Tonight my favorite was actually a pizza that had seafood on it (shrimp and scallops, yummy!). Nick said the best of the night was a pepperoni with red and yellow peppers (I'm not sure though... I don't like peppers). 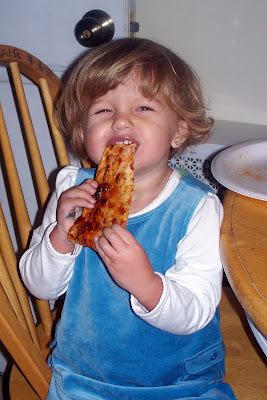 I think another favorite was a chicken pizza. I'll venture to say the tuna and onion pie was the least favorite of the night (I didn't even try it... but Andrea said it was like eating a crunchy tuna sandwich). 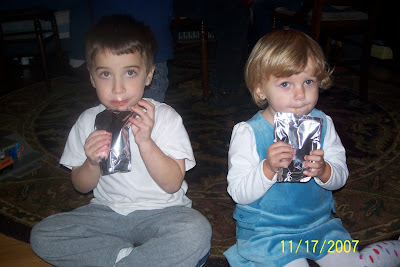 Zoe and Alex enjoyed some juices together. 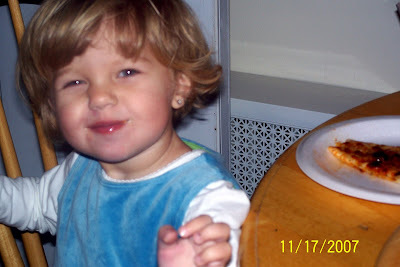 Zoe took a little time out from socializing to take a few bites of pizza. Yep... Uncle Gene makes yummy good pizza!!! I have to say I'm a bit disappointed in my camera. It seems like it just doesn't want to focus. Maybe tonight's problem was the smoke coming from the pizza cooking? If you spent too much time in the kitchen you ended up with watery eyes. Maybe it just wasn't good conditions for photography? Maybe a new camera is in my future? I'll have to try taking some random photos tomorrow and see how it goes.